Browsers are packed with settings and options, many of which are hidden. Each browser has a place where you can change advanced settings that aren’t available in its standard options window. 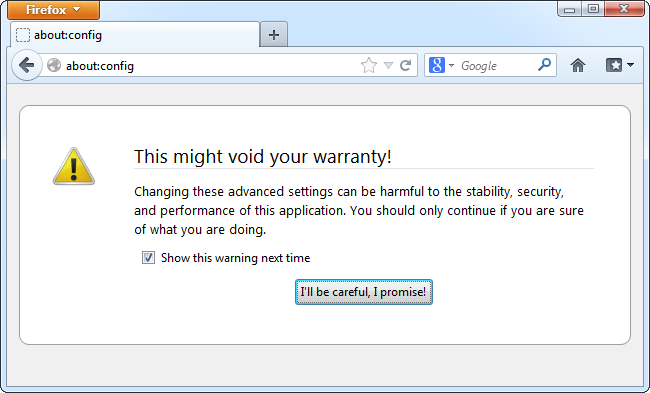 Note that changing some of these settings could negatively affect your browser’s performance, stability, or security. Many of these settings are hidden for a reason. Google Chrome’s stable settings are all exposed on its Settings page. 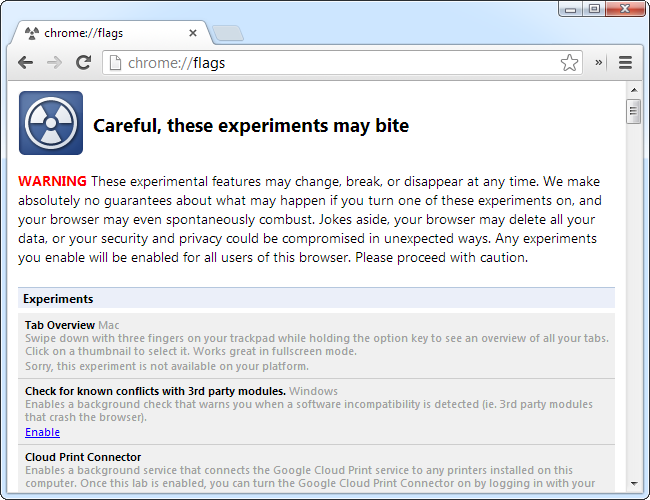 However, Chrome has a page where you can change experimental settings and enable experimental features. These options may change or disappear at any time and shouldn’t be considered stable. They could cause serious problems, so you use them at your own risk. 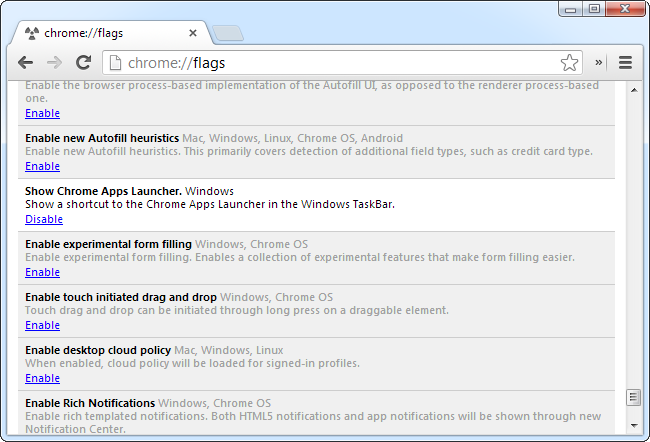 If you want to view and adjust these settings, type chrome://flags or about:flags into Chrome’s address bar and press Enter. 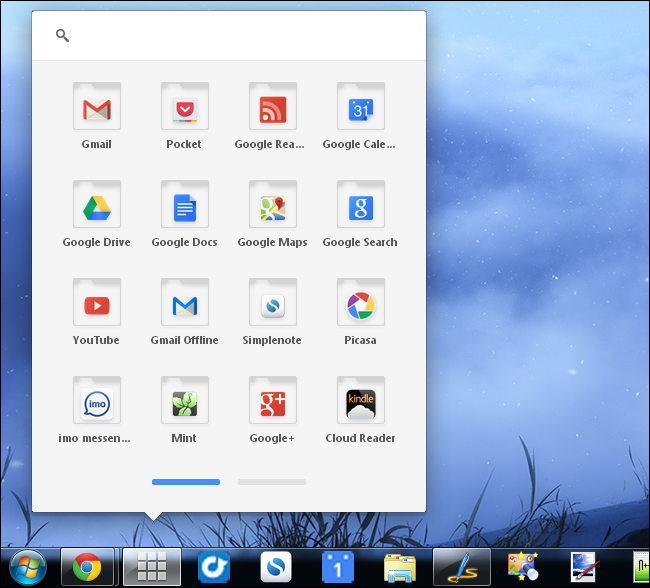 For example, some of the settings you’ll find here at the moment include the ability to enable a Chrome OS-style app launcher on your Windows taskbar (“Show Chrome Apps Launcher”), sync your favicons as part of Chrome’s open tab sync (“Enable tab favicon sync”), and save entire web pages as single MTHML files (“Save Page as MHTML”). After changing a setting, you’ll need to restart Chrome for the change to take effect. 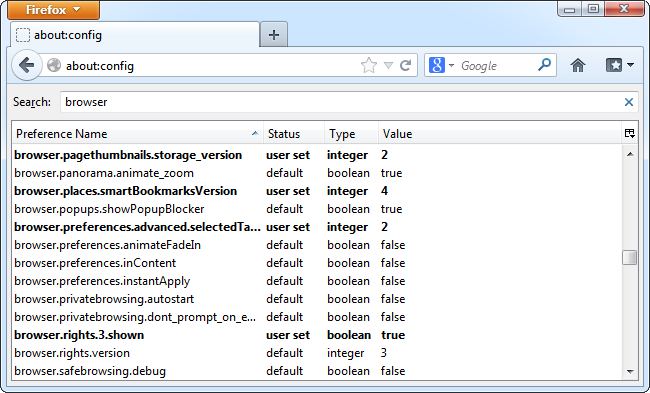 To access Firefox’s advanced settings, type about:config into its address bar and press Enter. You’ll see a warning page. Take the warning seriously – you could cause serious problems with your Firefox profile if you don’t know what you’re doing. Firefox’s about:config page actually stores every Firefox setting, including settings that can be configured in the graphical interface and settings for your installed extensions. Unbolded settings are the default settings, while bolded settings have been changed. However, you’ll also find interesting hidden settings buried in here. One interesting example is the browser.ctrlTab.previews setting. With this setting enabled, you’ll see a thumbnail list of open tabs when you use the Ctrl+Tab hotkey to switch tabs. This preview list only appears when you have enough tabs open. It’s set to a minimum of 7 by default, but you can change that by modifying the browser.ctrlTab.recentlyUsedLimit setting. You can look through the about:config page with the search field, but you’re better off finding lists of interesting about:config tweaks online. If you find a tweak you’d like to make, changing it is easy. Internet Explorer has settings that can’t be changed from its user interface, but they aren’t as easy to access. 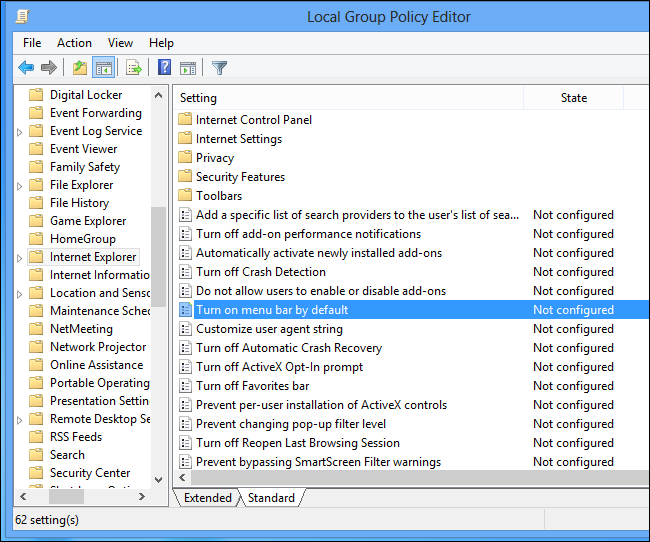 These settings can either by tweaked from the Windows registry or through the Group Policy Editor. Most of these options are intended for system administrators to lock down and customize IE deployments on a network. You’ll find IE’s settings under Administrative Templates\Windows Components\Internet Explorer. For example, if you miss the old File/Edit/View menu, you can enable it by default by setting the Turn on menu bar by default policy to Enabled. To access Opera’s advanced preferences, type opera:config into Opera’s address bar and press Enter. 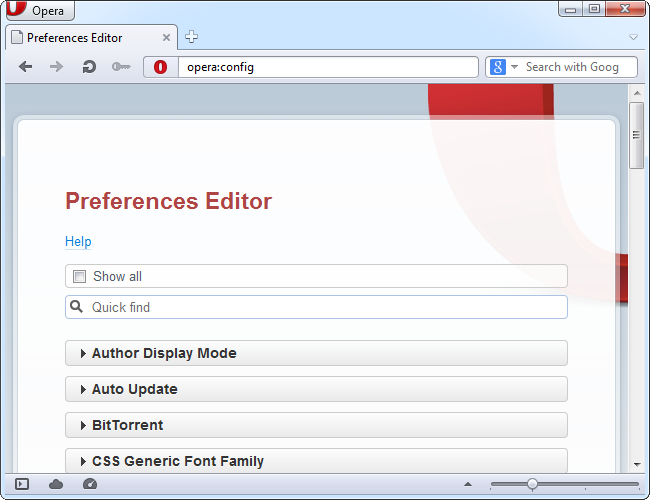 Opera’s Preferences Editor functions like a friendlier-looking about:config. As with other browsers, you’ll find a variety of settings in Opera’s Preferences Editor, including both settings available in the standard interface and hidden settings you can only change from this page. You can search for settings using the quick find box on the page. 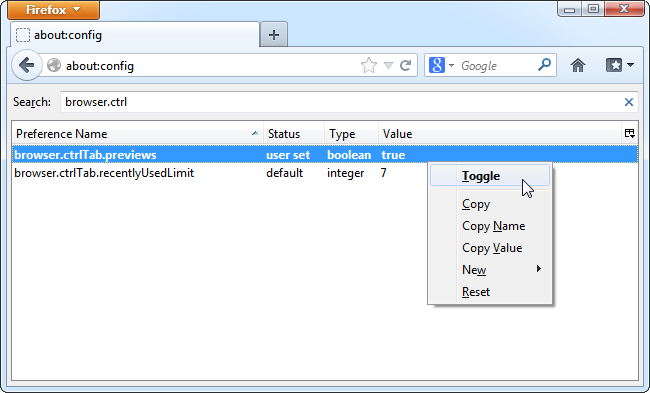 Unlike Firefox’s about:config page, Opera’s opera:config includes built-in help tooltips that explain each setting. Safari doesn’t appear to have an equivalent place to customize advanced, hidden settings. If a setting you want to change isn’t available in Safari’s options window, you’re out of luck – unless you can find an extension to change it, of course.